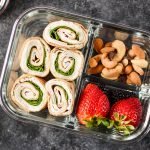 Pinwheels are a super simple deli lunch you can easily make at home and turn into meal prep! 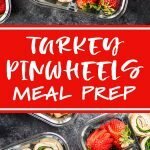 Check out my tips to help you make the BEST Easy Turkey Pinwheels Meal Prep!! 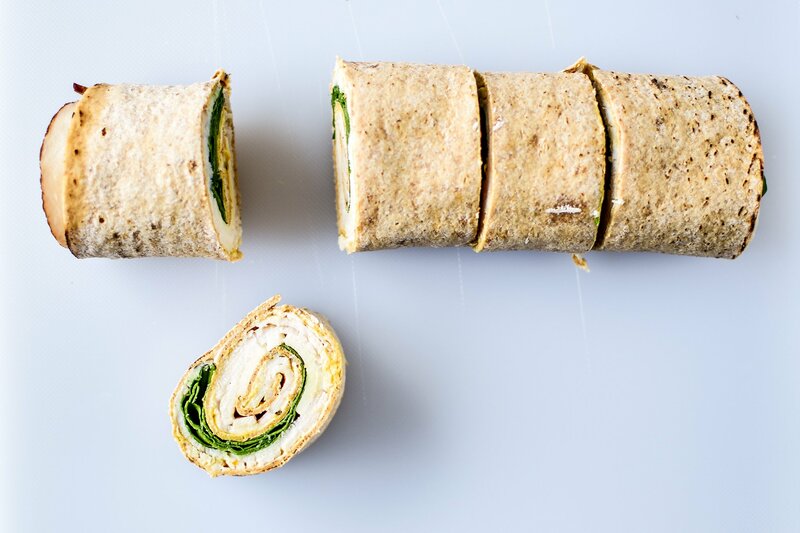 A roll up, a pinwheel, and sandwich roll… no matter what you call them, pinwheels are a simple yet glorious alternative to regular old sandwiches. And MUCH prettier. Not sure if you have a QFC near you (Quality Food Centers), but they have these pinwheels in the deli that I just can’t help but LOVE. Especially when it’s 80F and I’m tryna find a quick dinner to take across the street to my friend’s apartment (note: pairs well with beer and other cold alcoholic beverages, or LA CROIX because everything goes with La Croix). These days I try to be a little more prepared, but I’m still not perfect and I can’t promise I won’t ever buy those QFC pinwheels again. But I now have a viable homemade option ready to go, SUPER quick. Last year, these very tasty Turkey Pesto Tortilla Pinwheels appeared on the blog. 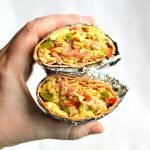 They are bomb.com, BUT one issue I had was the tortilla situation. When you roll a circular tortilla, you have weird ends to deal with. The center of the tortilla makes perfect pinwheels, but the sides are always weird and not “full pinwheel” status. It’s a little hard to explain, but if you’ve ever tried to make a pinwheel with tortillas, you know what I’m talking about. To remedy this problem, I decided to use Flatouts flatbreads – they’re more rectangular, so you’ve got FULL coverage across your entire shell. Pinwheel game strong!! No weird, wasted ends. I just cut the end pinwheels a tiny bit longer, and no one ever knew the difference. I’ve used the Italian and the regular variety for these pinwheels – both great! I’ve found that using a thicker condiment like cream cheese or Laughing Cow spreadable cheese works best. 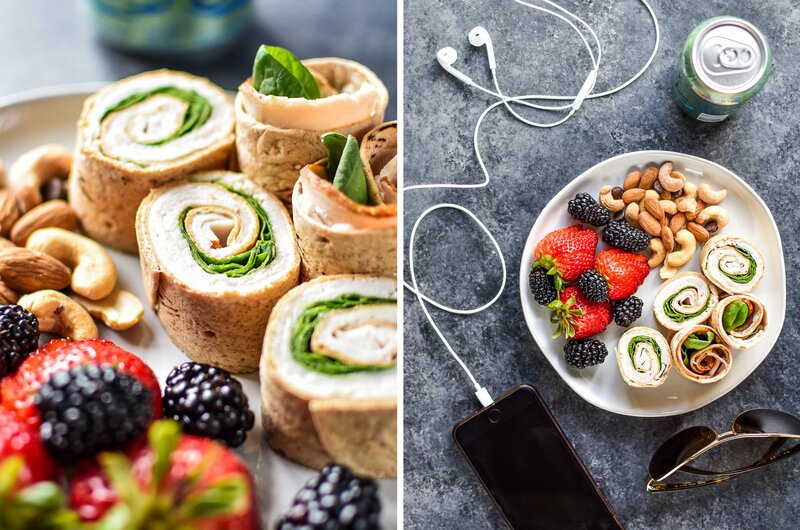 Condiments like mayo and mustard taste good in the pinwheels but are not great for meal prepping, and the pinwheel might get a little soggy. Meanwhile, using a thicker cheese style spread forms more of a barrier and keeps moisture from totally sogging up the wrap. Your condiment should cover the ENTIRE wrap or tortilla to the very edges. Deli meat should cover only 2/3 of your wrap (but get it all the way to the remaining edges). Leave about 1/3 of your wrap with condiment ONLY. This part will act as a “glue” to keep the pinwheel rolled up. Greens go in the middle – they notoriously try to escape during rolling. Just use your fingers and tuck them in as you roll. Roll from the meat covered end. This will be the center of your pinwheel! When using a Flatout flatbread, I cut the roll up into five pinwheels. I leave the end pieces a little bit longer so they have some nice solid pinwheel action inside (and they aren’t just weird ends), and then cut the middle into three even pieces. Two wedges of Laughing Cow spreadable cheese (35 calories each) as the condiment, 3-4 pieces of turkey, and some fresh baby spinach. FAVORITE and easiest combo. One wedge of Laughing Cow spreadable cheese, a small amount of my favorite mustard, 3 pieces of turkey, spinach, and one slice of cheddar cheese. Pesto cream cheese, 3 slices of turkey, romaine, tomato and a slice of provolone (detailed recipe here). FYI: You can find the Flatouts Flatbreads in the deli section with the fresh baked bread. They are NOT located near the tortillas. I looked around there for a long time. I found them at QFC and I also checked Safeway, but they only had the Flatouts artisan pizza crusts (I’ll try these soon!). You can also get the Flatouts on Amazon (affiliate link) but they are much cheaper at the store ($3.99 I think). Lay your flatbread or tortilla flat on a cutting board or other clean surface. Spread your condiment on first, being sure to cover the ENTIRE flatbread surface. Laughing Cow spreadable cheese wedges work really well – they are low calorie (the Light kind), taste great, and do not make the pinwheel soggy. You can use mayo and mustard, but your pinwheel may become soggy if it’s stored for more than 24 hours. Cream cheese also works, but it has more calories. Next, arrange your deli meat slices flat on the tortilla, covering about 2/3 of the surface (please see the detailed photo in the post above). Leave 1/3 of the tortilla covered with your condiment only. 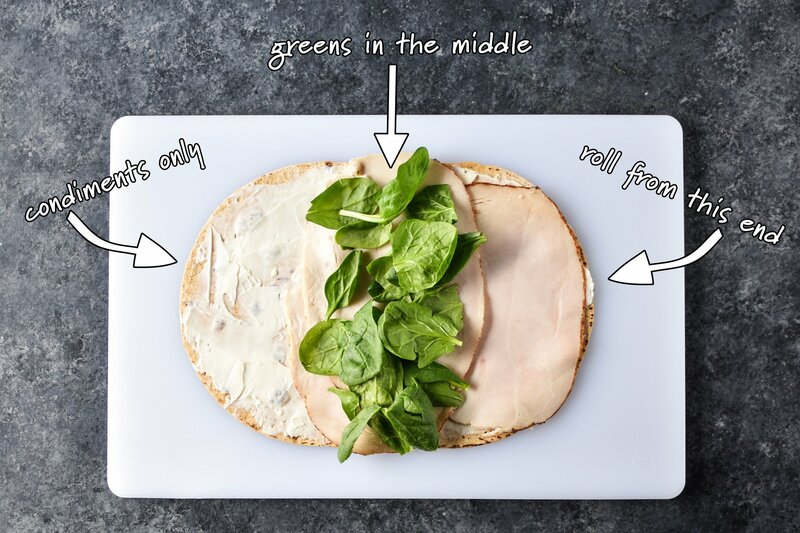 Add a slice of cheese if you want, then add your greens to the middle of the flatbread forming a line from edge to edge (please see the picture if this is confusing!). Begin rolling the pinwheel from the meat covered side, using both hands and rolling tightly. The greens may try to escape, but just use your fingers to tuck them in as you roll. 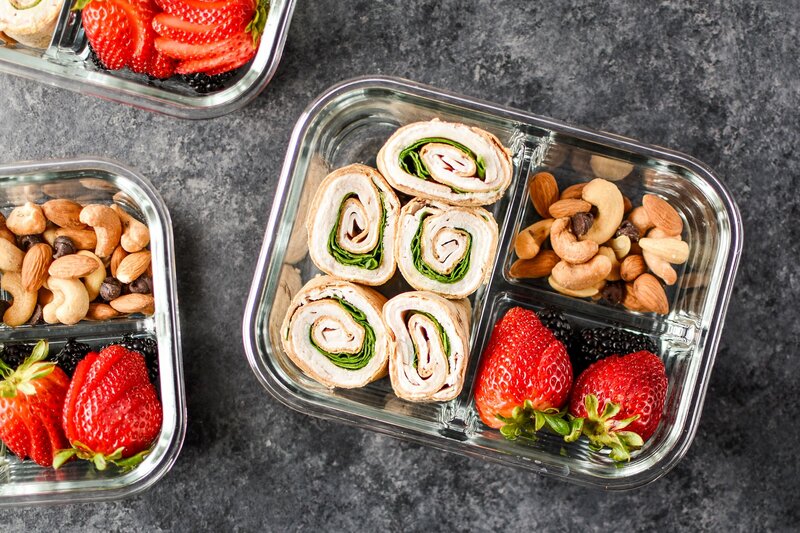 Cut the roll up into 5 pieces, and arrange in your meal prep container. Portion some berries and nuts to complete the meal! 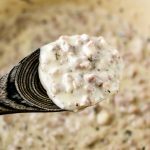 Prep up to 3 servings at once and store in an airtight container in the refrigerator. 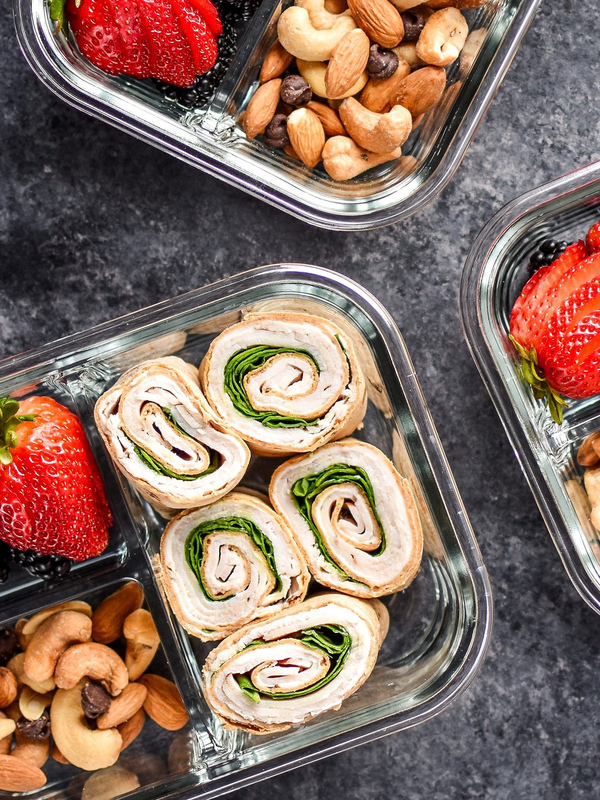 NOTE: These instructions make ONE meal prep lunch – just keep prepping more if you want more! 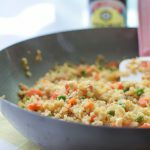 Since these are made one at a time, it’s easy to prep as little or as many as you want. 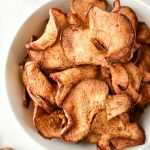 I would recommend prepping these only up to 3 days in advance. My favorite pinwheel flavor combos: 1) Two wedges of Laughing Cow spreadable cheese (35 calories each) as the condiment, 3-4 pieces of turkey, and some spinach. FAVORITE and easiest combo. 2) One wedge of Laughing Cow spreadable cheese, a small amount of my favorite mustard, 3 pieces of turkey, spinach, and one slice of cheddar cheese. 3) Pesto cream cheese, 3 slices of turkey, romaine, tomato and a slice of provolone (detailed recipe here). Nutrition information estimated with My Fitness Pal using combination 1 as an example. 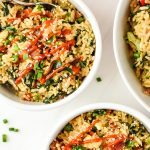 Thanks for checking out this Easy Turkey Pinwheels Meal Prep! Tag me or use #projectmealplan on social media to share your own version! 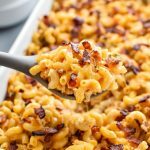 I’d love to try new flavor combos if you have any ideas. Please note – this post is not sponsored or affiliated with Flatout. I just think they’re great for pinwheels! Absolutely perfect for a school lunchbox, thank you! I LOVE the glass containers you use with the meal prepping. Where can I find them? Hey Amy! Aren’t they awesome? I get them on Amazon! Here’s a link to my post all about containers. You will be able to find the links to the 2 and 3 compartment glass containers there!